While one can point to Turkey's soaring inflation, plunging currency, surging interest rates or slumping stock market, the biggest threat facing Turkey is a structural one: its desperate need for foreign funding to cover its current account deficit. 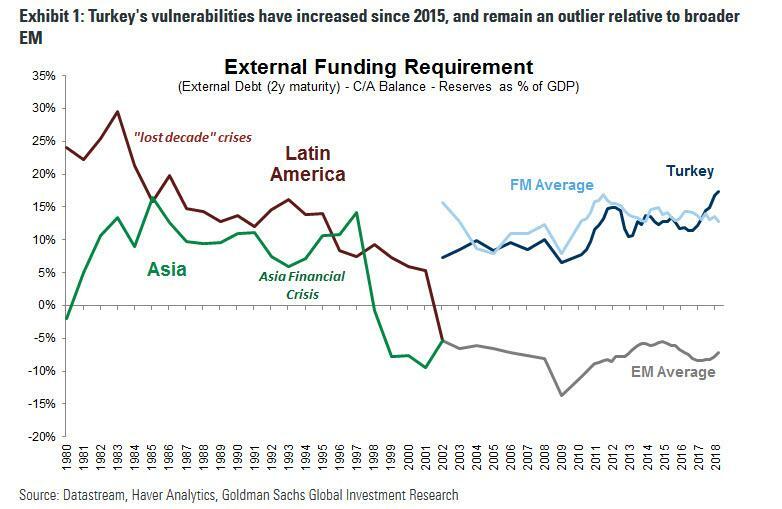 That is the point made by Goldman's Caesar Maasry this morning, who notes the biggest vulnerability staring both Emerging and Frontier Markets, namely their external funding needs, and notes that while EM funding needs are completely covered by reserves (meaning the likelihood of USD debt crises is extremely limited), "Turkey's funding needs are more like Frontier Markets, and in the same ballpark as the needs of Latin America economies in the 1980s and Asia in the 1990s." 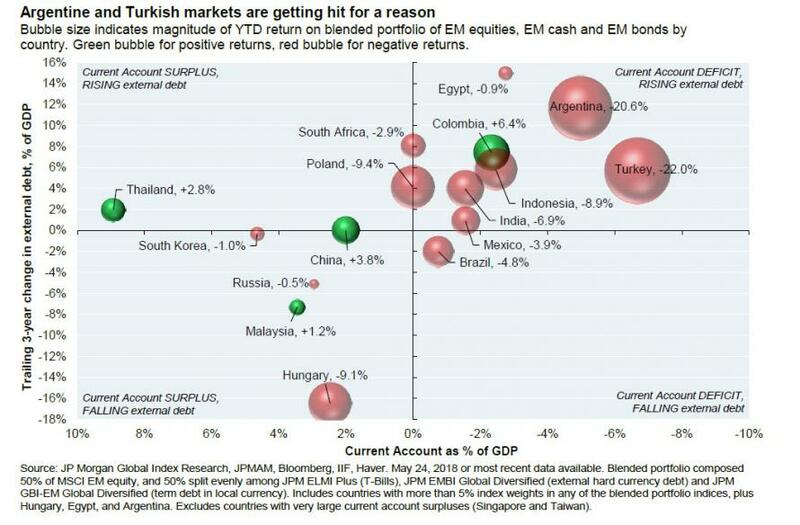 He then notes that floating vs. fixed exchange rates are an important difference compared with the EM crises of yesteryear, but adds that the starting point for Turkey's recent volatility is that these USD funding needs are extremely significant, much more so than other EMs, and are also the reason for why the market has finally started paying attention to Turkey as a result of foreign bank exposure to Turkey, because should these foreign inflows stop, the entire Turkish economy is in danger of a sudden freeze. But wait there's more, because as JPMorgan showed 2 months ago, Turkey faces a secondary threat in addition to its gaping current account deficit: a massive and growing debt load. If foreign buyers of Turkish debt go on strike, or if Turkey is unable to rollover near-term maturities, watch how quickly the currency crisis transforms into a broad economic collapse. So is there anything that can break the toxic spiral that Turkey finds itself in? Yes: a rate hike big enough to shock the market, coupled with an IMF bailout to backstop the country and restore foreign investor confidence. The problem is that neither of those are likely in the context of the Erdogan regime.